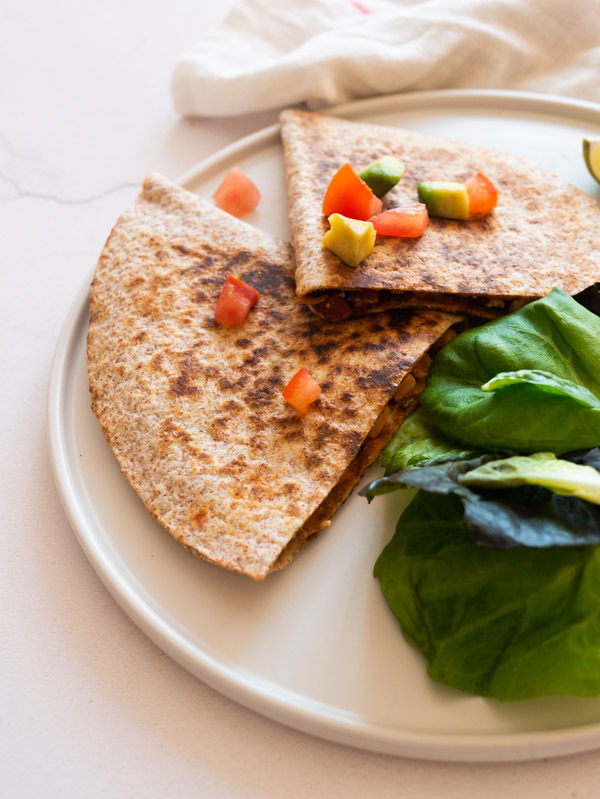 This chorizo quesadilla is filled to the brim with good stuff! Crisp chorizo is combined with sweetcorn, red pepper, spring onion, tomato and, of course, cheese for a super easy quesadilla recipe that everyone will love! 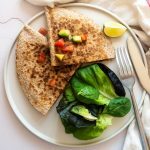 This chorizo quesadilla recipe can be served up alongside all sorts of dips (think guacamole, salsa or sour cream) or accompanied by a simple salad. Oops, I did it again. Another chorizo recipe. Sorry, not sorry. It’s delicious. 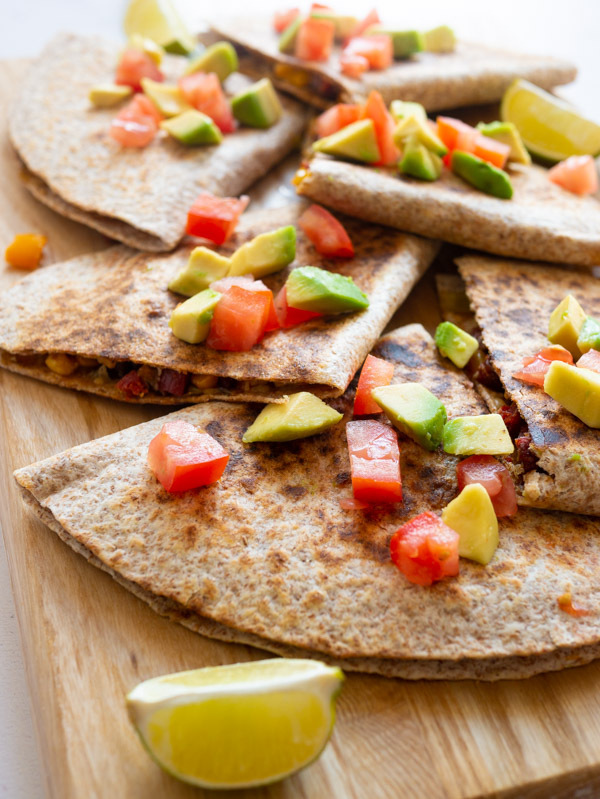 Especially in this Chorizo and Vegetable Quesadilla. 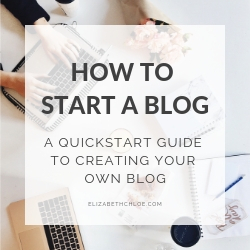 Sit down, make yourself a quick brew and let me tell you why. Can you really go wrong with a quesadilla? A crispy tortilla with a flavoursome and cheesy filling. This one has chorizo, corn, pepper and spring onion which are all popped under the grill to give an amazing char, then we add some fresh tomato, lime juice and (of course) cheeeeeeeeeese. You’ve got the saltiness from the chorizo, sweetness from the corn and peppers, creaminess from the cheese and a little bit of bitter from the lime juice. All together we’ve got a super tasty quesadilla that covers all those flavour profiles to make your tastebuds happy. The wonderful thing about quesadillas is that you can pretty much fill them with whatever you want. 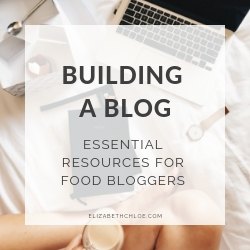 The veggies I’ve chosen here are ideal for Summer, but you could switch things up with some roasted squash and kale in Autumn, or roasted root veggies in Winter. It’s a quick little lunch that can adapt to the ingredients in the fridge. Winning. How do you make a quesadilla? To make a quesadilla spread your desired filling over a tortilla. You can use one tortilla by spreading the filling over one half and folding the remaining half over the filling. Or you can use two tortillas by spreading the filling over the whole tortilla and adding a second tortilla on top. Transfer your quesadilla to a preheated pan and fry for 3-4 minutes on each side until the tortillas and golden brown and crisp. Transfer the quesadilla to a chopping board and cut into the desired number of slices. Serve it with salad and some salsa or guac for dipping. Grab a plate that is the same size as your frying pan and place it upside down over the frying pan. Holding the frying pan handle in one hand and holding the plate down over the frying pan with the second flip the frying pan 180º so the plate is on the bottom and the frying pan is on top. Your quesadilla should be sitting on the plate. Pop the frying pan back on the heat and gently slide the quesadilla back into the pan, uncooked side down. This is the easiest way to do it without losing any filling. 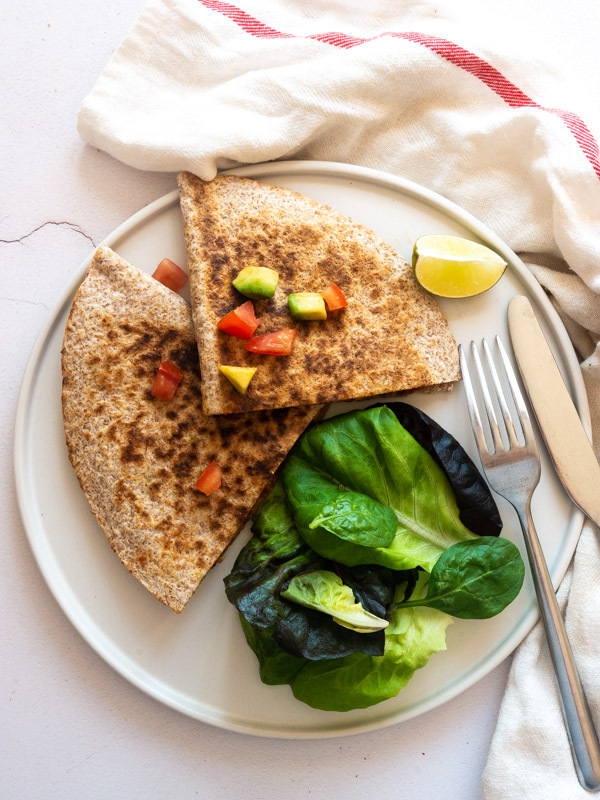 Whole-wheat tortillas are filled with crispy chorizo, corn, peppers, spring onions and gooey cheese to make these quick and easy quesadillas. Pre-heat your grill/broiler on a high heat. 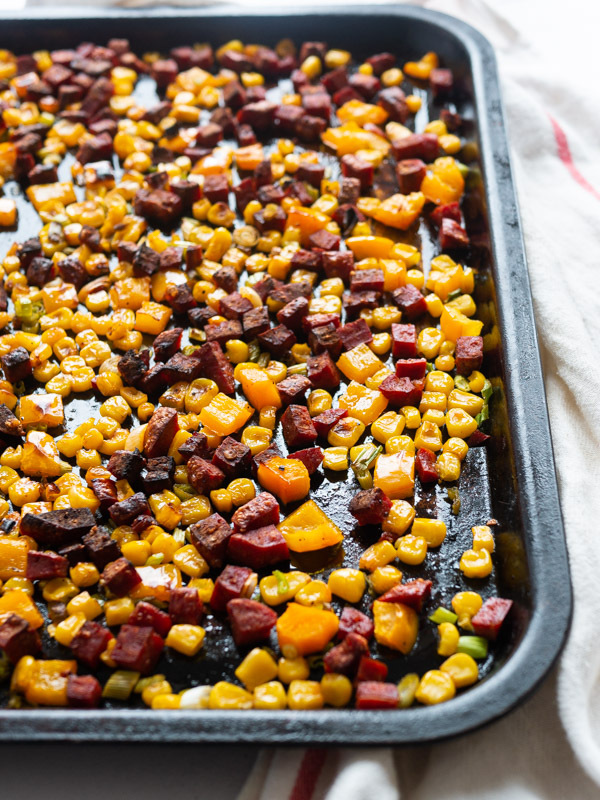 Spread the chorizo, corn, bell pepper and spring onions on a baking tray and season with the ground pepper. Put the baking tray under the grill for 6-8 minutes until golden brown, turning halfway through. Remove the baking tray from the grill and leave to cool for a few minutes. Then, either on the baking tray or in a separate bowl, mix in the cheddar cheese, tomato and lime juice. Lay out your tortillas. Equally divided the filling between the tortillas, spreading it in an even layer on one half of the tortilla. Then fold the other half over. Pre-heat a frying pan to a medium heat. Pan fry the quesadillas individually for 3-4 minutes either side until the tortilla is golden brown and crisp. Keep the quesadillas warm while you cook the rest. Serve with salad and a dipping sauce like guacamole or salsa and enjoy! I made the quesadillas this evening and they were lovely. I forgot to take a picture, They git eaten too fast! Delicious. The tip for flipping them over worked well and they were nice and crispy!